My relationship with Nightwish is not the most fanboyish, as I never thought much of them when they had operatic diva Tarja on vocals. I actually found the wailing version of ‘Over the Hills & Far Away’ quite hilarious, and although I appreciated that the music was clever and passionate I just couldn’t get over the vocal style. When they ditched the diva and got in Anette Olzon I was intrigued at first, then overjoyed with the superb ‘Dark Passion Play’. Like many I didn’t go mental over ‘Imaginarium’, but still enjoyed it for what it was. With Olzon gone, it was a relief that Nightwish picked up the amazing Floor Jansen, a woman certainly capable of delivering all the power and passion required to tackle old and new tunes. Having proved herself live, few could doubt she would hold her own on the new album, and she certainly has. Opening track ‘Shudder Before The Beautiful’ blasts out of the speakers with speed and gusto, a song that sounds as Nightwish as it possibly could. Floor sounds excellent, although very slightly low in the mix for my taste, and the track barrels along with aggression and melody – should be a great live opener. The track is obviously designed to convey the message that Nightwish are back, and it does so most effectively. ‘Endless Forms Most Beautiful’ is a masterful work, based around the concept of evolution. It features several spoken word pieces by Richard Dawkins, and hopefully will annoy creationists everywhere. The song mix is typical of Nightwish, with fast tracks balanced by slow, haunting melodies. Standout tracks for me are the faster pieces like ‘Weak Fantasy’, ‘Yours is An Empty Hope’ the opening track and the title track, as well as the lead single ‘Elan’, which really grew on me the more I listened to it (and the louder I turned it up). ‘our Decades In the Sun’ is a beautiful power ballad, ‘My Walden’ has an uplifting, mid paced Celtic lift to it, whilst ‘Edema Ruh’ and ‘Alpenglow’ round off the bulk of the album in marvellous melodic style. So that’s about 47 minutes, enough for any album, really, but Nightwish aren’t your usual band. The last half an hour of the album consists of just two tracks, the rather dull ‘The Eyes Of Sharbat Gula’ and the 24 minute epic closer ‘The Greatest Show On Earth’. The former is 6 minutes of the dullest background music I’ve ever heard, is responsible for the docked half mark, and will definitely be deleted from my iPod. The latter is, well, rather epic. The running time is roughly split in half between the lengthy, and atmospheric, opening and closing pieces, which sandwich a monster of a mid section that will delight fans of the ‘Dark Passion Play’ title track. It’s not perfect, as the outro is far too long, really, but taken as a whole it’s a great piece of music. Anyone who had doubts after ‘Imaginarium’ and the departure of Olzon can rest easy with ‘Endless Forms Most Beautiful’. It’s a wonderful example of what orchestral power metal can do when it’s in the hands of the right people. Full of life and some very catchy music, it should put Nightwish back at the top where they belong. 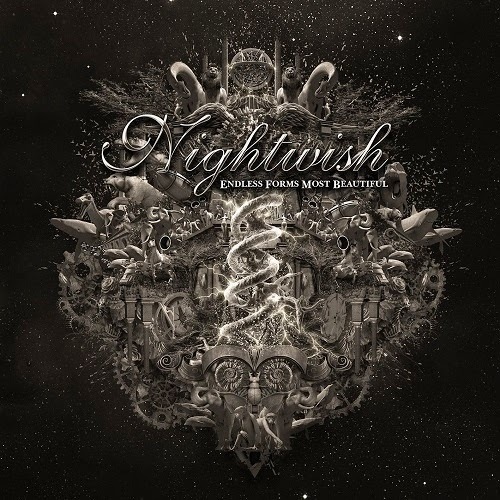 Endless Waiting but Most Beautiful Album...Nightwish with Floor = magnificent..I've enjoyed all 3 singers, particularly Floor in her Ghost Love Score performance. ﻿I have listened to the whole new album and can say it has a mix of metal and soft tunes. I agree Floor is slightly buried in the mix here. What the hell? They have this amazing new vocalist...Maybe it seems they didn't want Floor's voice to overwhelm the MUSIC. But after listening to the album at least three times) I have come to terms that this new album is incredible. The last song "The Greatest Show on Earth" which is sensational, takes you on a beautiful ride blending in with unique play. I love the direction nightwish has taken on this album!!! I will support there hard work. Maybe it will become one of my favourite Nightwish albums!! PRONG: "Songs From The Black Hole"
DORIS BRENDEL and LEE DUNHAM: "Upsidedownworld"
UFO: "A Conspiracy Of Stars"
KYLE GASS BAND: "Our Job To Rock"
VIE JESTER: "Etches In Aether"
SADA VIDOO: "A Story With No End"
ROBBEN FORD: "Into The Sun"
The ANSWER: "Raise A Little Hell"
JAMIE-LEE SMIT: "Mon Amour Monique"
JAMIE THYER: "Postcards From Bedlam"
MICHAEL SCHENKER: "Spirit On A Mission"
SCOTT WEILAND and The Wildabouts: "Blaster"